How to add an interactive polling widget to your Honey post. Looking to gain insights, feedback, or opinions from your team from your team? Honey polls are here to help. 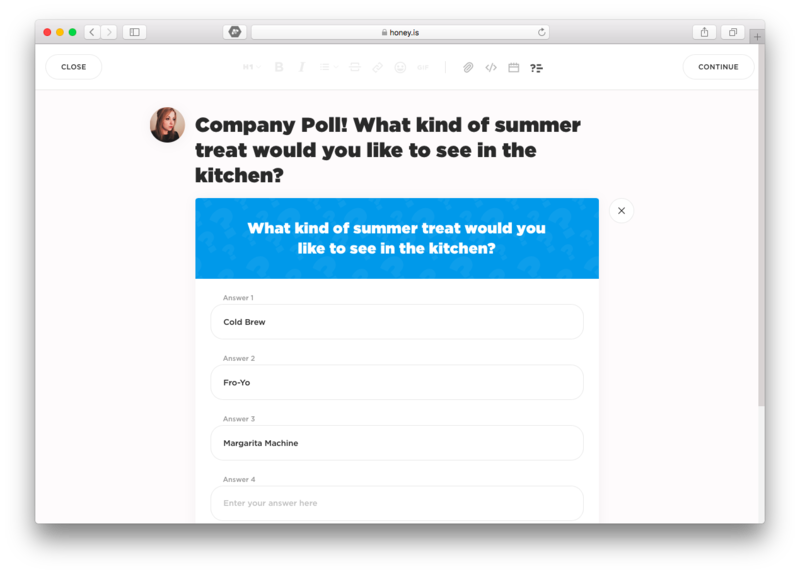 We'll show you how to add a polling widget to your Honey post. While on the feed page, click the orange New Post button in the bottom, righthand corner of your screen. A blank composition form will open. Select the poll icon at the righthand side of the formatting toolbar in the composition form. This will drop a poll widget into your post form. Type your poll question in the widget header and add your answer options. All polls are multiple choice and you can add up to ten answers as well as multiple polls per post. At the bottom of your polling widget, you'll see a few settings options to help you manage responses. When toggled on, all responses to your poll will be anonymous to all users, including the poll author, admins, and moderators. When toggled on, only the poll author and Honey admins will be able to see the poll results. When added, an end date for your poll will appear to which the responses will then be closed. Keep in mind that after publishing, you will not be able to update these settings. Once you have finished your poll and are ready to share, select the Continue button at the top, righthand corner of the page. Once ready to share, click the blue Share to... button to publish your post.